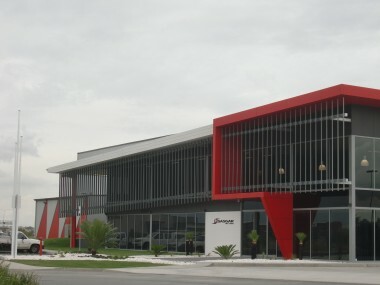 A new Workshop, Showroom and Fire Fighting support facility has recently been completed at TradeCoast Central for Sasgar Pty Ltd.
Sasgar, are a true Australian success story. The McEwen family have been involved with the manufacture, sales and support of fire fighting vehicles since 1950 and are now the sole agent and representative office for Rosenbauer covering Australia New Zealand and the Pacific Islands. Over the last five years Sasgar have supplied more than 85 Aviation Rescue Fire Fighting Vehicles – a number they expect to surpass in their new purpose built facility.